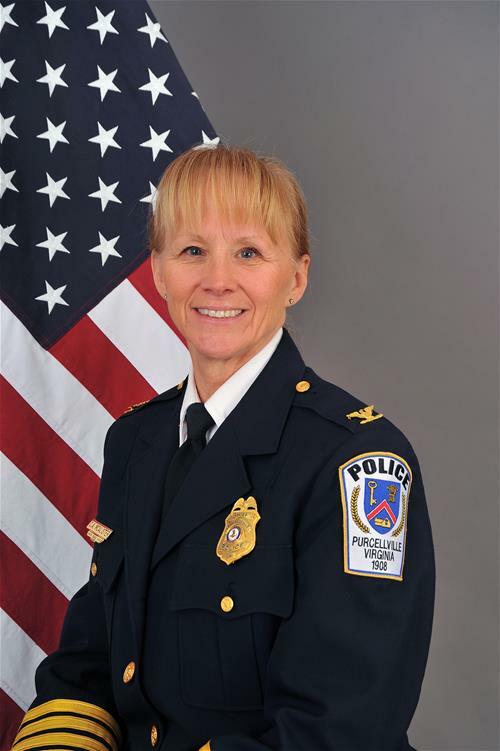 Chief Cynthia McAlister joined the Purcellville Police Department in June 2015, after retiring as Patrol Bureau Major with the Fairfax County Police Department. She brought with her 33 years of police experience in various fields of police operations. Chief McAlister began her career as a patrol officer working in the Chantilly and McLean areas of Fairfax County. She advanced to the Public information Office and on to the Major Crimes Division as a juvenile fugitive and child abuse detective. Upon promotion to the supervisory level, she oversaw the Financial Crimes Unit, Field Training, and various patrol squads. Once promoted to Commander, Chief McAlister was involved in Animal Services, Patrol Command, Criminal Justice Academy operations, Resource Management, and Patrol Bureau operations. Chief McAlister has enjoyed living in the Purcellville area since 2003 with her husband and two children. Engaging with the youth is a priority for her. She believes community engagement is the key to good community relations, which aids in building a community with high quality of life standards. Community policing is the cornerstone to her philosophy, where collaboration and problem solving with all stake holders is her formula for successful community problem solving outcomes.